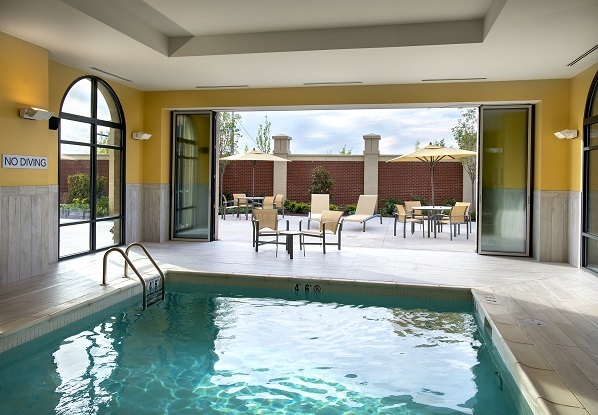 Marriott International has begun inviting guests to experience modern style fused with rustic elegance at its newest property, Courtyard Philadelphia Lansdale. The highly anticipated hotel offers an array of big city services and amenities in a historical, suburban setting, including comfortable accommodations, spacious function venues, and a unique full-service restaurant and bar integrating a ceiling canopied by wooden planks from the Crayola Factory. Courtyard Philadelphia Lansdale opened earlier and is located at 1737 Sumneytown Pike, Lansdale, PA 19446. Serving American cuisine with a regional twist, locals and guests alike are encouraged to discover Philadelphia’s local flavours at The Porch, where seasoned chefs whip up a wide variety of dishes incorporating Valley Shepard cheese, Amoroso’s baked specialties and Freddy Hill Farms ice cream, among others. The restaurant has both indoor and outdoor seating, perfect for guests to wine, dine and feast their eyes on the beautiful views of the lush foliage surrounding the property. including The Forum Ballroom and seven breakout rooms, plus an outdoor patio location. Custom catering is available for guests utilising the event and function amenities. “Our property is unlike others in the area,” said Edward Busch, general manager of Courtyard Philadelphia Lansdale. The hotel is one of the first Courtyard by Marriott hotels in Philadelphia with the brand’s new CYnergy design, incorporating sophisticated details into functional spaces. The progressive design features plush bedding, brightly lit bathrooms and clutter-free areas for work and relaxation. Guests can get their caffeine fix at Starbucks and enjoy breakfast and light bites at The Bistro. Complimentary Wi-Fi allows guests to stay connected, and recreation is within reach with a fitness centre, indoor pool and whirlpool. The newly built hotel is conveniently located for short commutes to numerous destinations of interest to business and leisure travellers. The Morgan Log House, Valley Forge National Park, Dorney Park and Wildwater Kingdom, Morris Aboretum and Elmwood Park Zoo surround the Courtyard Philadelphia Lansdale. In addition, guests can tee off at a golf course and take their morning run at jogging trails, both of which are in close proximity to the property.